Jon Athan: Black Friday 2015 Deal - 10 Days: Undead Uprising only $0.99! Black Friday 2015 Deal - 10 Days: Undead Uprising only $0.99! It's time to celebrate Black Friday 2015 on Amazon.com! From November 23rd through November 29th, you'll be able to purchase 10 Days: Undead Uprising for $0.99 — that's a whopping 75% off! This huge discount is only available through Black Friday week, so keep an eye on the clock and don't miss out! 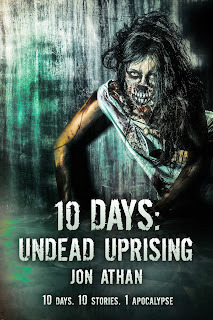 10 Days: Undead Uprising is an interconnected horror anthology. Undead Uprising connects 10 short stories to tell one massive tale about a zombie apocalypse. Zombies become stronger through mutation, humans become deviant through tragedy, and the world crumbles through catastrophe. If you love zombie horror, this is the book for you. $0.99 — Black Friday Week Only!